You are here: Home / exercise / Bathe Your Muscles in “Acid” … What? Looking for a super-effective workout that will obliterate belly fat while making you stronger and give you a ripped physique? 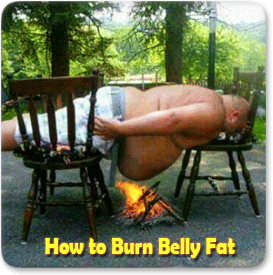 While you could give something like the image to the right a try to burn your belly fat, there’s a much better way to get rid of stubborn belly fat once and for all. And while both approaches are going to involve some pain and discomfort, only one will get you the results you’re craving! We recently started a new series of videos that cover Rep-Range Lactic Acid Workouts. Lactic Acid is the pre-cursor to Growth Hormones, which are the ultimate fat-burning hormones your body produces. When you add specific workouts developed to release more lactic acid, you’re going to put your body in a fat-burning zone that will release growth hormones and ultimately burn more belly-fat. Discover the Lactic Acid Afterburn Effect to Kick Fat-Burning Hormones into Overdrive! Research has shown that it’s not just about eating right and doing lots of cardio exercises. That simply won’t cut it! You have to weight train. Women, that means you too! Do you want those curves in the right places? Choose a body part you’d like to work on. In this video, I use the “triceps pull-downs” to work my triceps as an example. In terms of tempo, you’re going to want a slower tempo for the heavier 6-8 rep set, a moderate tempo for the 12-rep set, and a considerably quicker tempo for the 25-rep set. After completing one of the above circuits, rest a full two minutes before starting the circuit again. You’re going to want to aim for completing two full circuits when starting out, and then strive to progress to three or even four circuits as you gain muscle strength and endurance. This workout will stimulate more lactic acid, which in turn will release anti-aging, fat-burning hormones. Note: You should only train with RRLA workouts for a period of six to eight weeks before taking a break from them; otherwise, you’ll run into over-stimulation of the muscles and risk injury. Another note: As you gain more experience, you don’t have to do the same exercise for all sets. If you struggle to complete the 25-rep set (as you should!) and can’t make it all the way to 25 reps, pause for 4 to 5 seconds before resuming. But make sure that you do complete a full 25 reps in order to get the full lactic acid effect and kick your fat-burning hormones into overdrive. This workout isn’t for those who want an easy, gentle workout free of discomfort. You’re really going to feel the lactic acid afterburn effect and it’s going to get uncomfortable. But it’s also going to work, and the results are going to be well worth the struggle. And while it may feel like your muscles are truly on fire, thankfully you don’t have to resort to building a real fire to get the results you’re seeking! !